I am looking at building my Fade Wish (Wade Fish hull and deck with Blue Fin sole and cockpit) with a drive well. Was the drive well used as the front scupper? Yes Dale I only used the drive well as the front scupper. I did put a little up turn in my seat box floor so the front of the well ran back to the front of the drive well. 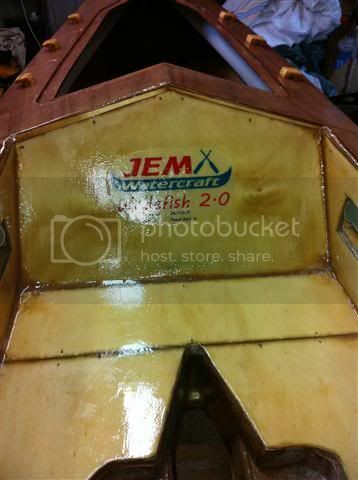 There would be some pics & explanation in my Tassie Wadefish build. PiratePete wrote: Yes Dale I only used the drive well as the front scupper. I did put a little up turn in my seat box floor so the front of the well ran back to the front of the drive well. I recently bought the latest Hobie Drive (not the 180) and noticed that they included a set of tabs on the very bottom of the drive. I believe this changes your setup and specs. Have you or anyone solved for this yet or did I just miss it in the above posts? Hobie has suggested to cut off the alignment tabs so that it can fit older Hobie kayaks. You can find this info on either the Hobie website or their Forum. However, I do not know if that will allow the newer Hobie drives to fit in this drive well. I do not have a newer drive to test it with. If I ever build a new kayak, I probably will redesign the drive well to accommodate the latest Hobie drives.